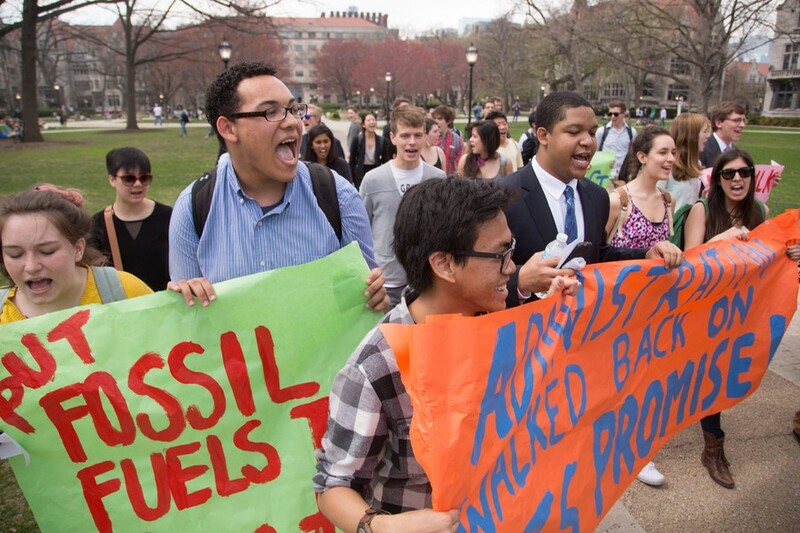 Last Friday, approximately 100 students participated in a “Walk Back” for fossil-fuel divestment organized by the UChicago Climate Action Network (UCAN). The animated crowd donned business attire as they marched facing backward from the Booth School to Levi Hall to protest the administration’s decisions regarding the UCAN divestment campaign. A sunbathed quad packed with hundreds of other students looked on as participants chanted and displayed banners promoting divestment. Second-year Johnny Guy, the divestment campaign coordinator, recounted the campaign’s history. Last year, after delivering a 59-page report about fossil-fuel divestment, UCAN met with Secretary of the University Darren Reisberg and other administrators to discuss the issue. “Reisberg committed in writing via e-mail to securing us a meeting with at least one member of the Board [of Trustees], a promise that he later [retracted] this year, citing it as an inappropriate form of engagement,” Guy said. Participants in the march walked backward to demonstrate their view that the administration has reneged on its commitment to UCAN. However, the administration did offer a UCAN member a spot at a student group dinner with a trustee. UCAN was dissatisfied with this proposal and has thus far declined. “This type of engagement is egregiously insufficient for any type of meaningful dialogue… and falls far short of the level of engagement committed to by Reisberg,” Guy said. A statement by University spokesperson Jeremy Manier cited the Kalven Report of 1967, which addresses the idea that a university must remain independent from political pressures. Once the crowd reached its destination in front of the administrative offices in Levi Hall, marchers gathered to hear UCAN leaders explain the ensuing steps. Participants were encouraged to continue chanting as UCAN representatives Kristin Lin, Kenzo Esquivel, Sam Zacher, and Guy entered the building to discuss the situation. Their intention was to present Reisberg with a letter expressing disappointment with the administration and demanding a reaffirmation of its commitment to set up a meeting between members of the divestment campaign and the Board of Trustees. However, Reisberg was not in his office at the time of the march. Instead, the four UCAN members spoke with on-call administrators for approximately 15 minutes about the protest and their expectations moving forward. In his statement, Manier reaffirmed the University’s commitment to sound investing in diligently researched entities. Editors’ note: Kristin Lin is editor-in-chief of Grey City, The Maroon’s quarterly magazine.